Your adoption supports our work to establish reduced speed zones and other protections to keep whales safe from vessel strikes and entanglement in fishing gear. Found in all the world’s oceans, blue whales are the largest animals ever known to exist on Earth. They can range in size from 80 to 100 feet and weigh upwards of 200 tons. Unlike many other whales, blue whales are solitary creatures preferring to travel alone or in pairs, but they can communicate with others up to 1,000 miles away. 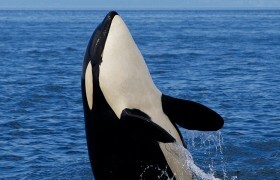 Even though whaling has been banned, whales continue to be impacted by humans because of ship strikes and entanglement. Before whaling became a common practice, hundreds of thousands of blue whales swam in our oceans. Between 1900 and the mid-1960s, an estimated 360,000 blue whales were slaughtered, and they have struggled to recover. Today, experts estimate there are only a few thousand left. Though whaling has been banned, blue whales still face major threats from collisions with ships and entanglement in fishing lines and nets.